On Sunday, local residents sadly woke up to Nazi graffiti on our streets by the Dollis Hill tube station area. I was alerted to this on the day and joined local residents in scrubbing the horrific graffiti off in what was a great instant community response. Last night we organised a vigil to get people together and show our unity against this abhorrent act of vandalism. Local children placed positive messages at the location where the hateful graffiti had been sprayed. We were joined by the local Rabbi from the Brondesbury Synagogue. It was humbling to see that attempts to create division had created a positive community response and united us. Police have been informed as this is clearly a criminal act and the Council have been helpful in deep cleaning the graffiti to ensure no paint marks or signs of the red graffiti remain. An ASBO has been given to a graffitist who has been the culprit of eyesores in Dudden Hill, Willesden and Kilburn – as well as on the tube and rail networks. His graffiti damage has cost Brent Council more than £1,800 to clean up. If any residents have issues regarding anti-social behaviour they should call the Brent Safer Neighbourhood Team on 0300 123 1212 or Brent Anti Social Behaviour Team on 0208 733 3932 or 0208 733 3940. 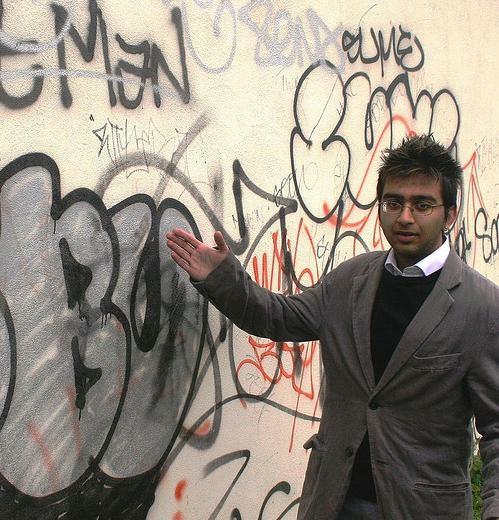 I have highlighted the problem of Lib Dem neglect in Brent and issue of graffiti in the past. Now The Liberal Dem led Brent Council is failing to tackle the rising tide of graffiti vandalism even at it’s own Town Hall as the attached photographs taken by Labour Councillor James Powney, illustrate. See pictured Labour Leader, Cllr Ann John next to the offending graffiti outside Committee Room on the second floor at Brent Town Hall. “The Lib Dems cannot even clean up the Town Hall let alone the Borough”.